On 19 October 2015, Aljazeera Arabic reported to have received an audio in which Iyad Ag Ghali. Ag Ghali, Ansar Al-Din’s founder and leader, expressed his discontent regarding the peace agreements recently signed by armed groups representing northern Mali and the Malian government. In response, Ag Ghali threatened to increase his operations against French forces operating in Mali. In the audio recording, Ag Ghali described northern Malian armed groups as “secular and defeated.” The former Tuareg rebel also accused northern Malian groups of having abandoned al-shari’a, the Islamic law, and jihad. Referring to the peace accord signed in June 2015, Ag Ghali stated that the Azawad movements had handed their land to the Malian government in exchange for limited advantages, while ignoring the rights of its people. Ag Ghali said this peace agreement would only bring back abuse and marginalization against the people of the north by the Malian government. 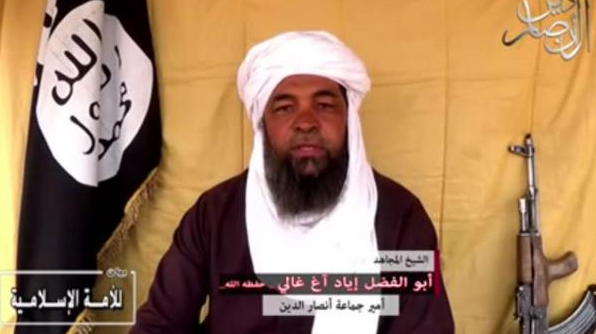 Since the French intervention in Mali in January 2013, Iyad Ag Ghali had all but disappeared. French forces managed to locate and either arrest or kill high profile jihadist group leaders operating in northern Mali, notably Abdelhamid Abu Zaid, Abdelkrim al-Targui, Ahmed al-Tilemsi, Abu Bakr al-Masri, Ali Ag Wadoussene, and Ibrahim Ag Inawalen, and yet failed to even locate Iyad Ag Ghali. Truly, Ag Ghali enjoys an unmatched local support in Kidal region, especially north of Kidal city near the border with Algeria. Also it’s an area where French forces have conducted very limited number of operations. Ag Ghali is an Ifoghas Tuareg and a native of Boughessa, Kidal region. Reporting has suggested that he might have escaped to Libya but that is unlikely because of the unmatched support and backing he holds in the northern Kidal region; he has no need to take the risk to hide in a more troubled country, Libya. Villages in northern Kidal region like Boughessa, Abeibera, Tinzawaten, and Tassissat all provide ideal sanctuary for Ag Ghali. Additionally, the area is ideal because of access to logistical supplies, such as fuel and food, from Algerian border towns such as Timiaouine and Inerkache. All these remain speculations and only time will tell us where Ag Ghali is, how much influence he still has and why French and allies unable to find him. How serious is the information about Ag Ghali for the creation of the Macina Liberation Movement, a group that started terrorizing southern and central Mali? This should not be overlooked as a Timbuktu local who was in the city when it was occupied by al-Qa’ida in the Islamic Maghreb (AQIM) and Ansar Al-Din, and attended some of their meetings has advised. The local reported to me that indeed Ag Ghali and Amadou Koufa recruited among the Fulani community, and trained them in Alfarach, a town north of Timbuktu. Although difficult to confirm, a lot took place in northern Mali while no state actors were present in 2012, making his account not only plausible, but likely.